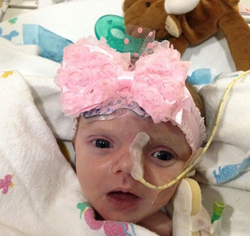 Calloway Insurance debuts a new charity campaign in Dallas, TX to support Maddie and her family by raising funds to help relieve medical expenses brought on by the various surgeries and treatments required to keep this little newborn alive. We cannot imagine the devastation these young parents felt seeing their baby girl go through something as delicate and as complicated as heart surgery; especially just a few hours after birth. With a new charity program in the Dallas, TX area, Calloway Insurance has joined efforts with its community to support Maddie and her family, and announced that they will be raising funds to help alleviate the numerous medical bills currently due as a result of Maddie’s delicate heart condition. Maddie has undergone several surgeries in her short life. Unfortunately she still faces a challenging journey requiring two additional heart surgeries before the age of three. To support this cause and join Team Maddie, donations can be made at http://www.callowayinsurance.com/Team-Maddie_16_community_cause. Utilizing its own resources and seeking the help of its own network of customers and business partners, Calloway Insurance marches on to ensure customers, friends, family and neighbors are always in good hands. The agency just recently launched the master charity program of which the current campaign is part of, electing every 60-90 days a new individual, organization or family in need to receive their support. To join Calloway Insurance in supporting little Maddie and her family, donors are encouraged to visit http://www.callowayinsurance.com/Team-Maddie_16_community_cause and share the page with their friends and family. Contributors may be acknowledged for their donations through the agency’s monthly magazine. Once the current campaign is over, Calloway Insurance will continue to work closely with Maddie’s family as well as nonprofit organizations in the area, to make sure resources are directed to capable hands that can help better the local community, one family or person at a time. Information regarding past and current campaigns supported by the Agency can be found http://www.callowayinsurance.com/community-cause. More information about Calloway Insurance is available at http://www.callowayinsurance.com. Serving from offices in Dallas, TX, Calloway Insurance is committed to bringing local communities an insurance agency that understands their needs. Taking pride in its team of professionals, Calloway Insurance works with carriers to assemble a variety of products and services for its customers. From all of the products a typical consumer needs (home, auto, boat, ATV, etc.,) to all financial services products and tools (retirement, savings, long term care, disability, etc.,) and business insurance (liability, building, auto) to workplace and individual benefits (accident, critical illness, cancer, disability, life), Calloway Insurance covers all the bases for insurance needs in the Dallas, TX area.